Glacial water flows down the upper Atna River to give Atna Lake its emerald green colour. This remote lake and river system are nestled on the lee side of the Coast Range. Landscape and wildlife views are abundant in this isolated wilderness. Atna River Park includes the Atna River, Atna Lake and most of the area surrounding the lake to the height of land. The park protects a broad subalpine valley with vegetation that is transitional between coastal and interior ecosystems and contains important Grizzly Bear and Mountain Goat habitat, and an extensive wetland complex along the Atna River. The park also contains important fish habitat, including spawning habitat for Sockeye Salmon. Recreational activities include canoeing, hiking, mountaineering, hunting, fishing and wildlife viewing. A series of three short portages along the Atna River and around the dramatic waterfall allow canoeists access to Atna Lake from Morice Lake. There are no water taps located in the area. You must use a reliable method of water purification, as no potable water is provided. Either boil drinking water for at least two minutes or use a commercial water filter effective against Giardia (beaver fever). Atna River Park is located in west-central British Columbia, approximately 100 km southwest of Houston. Access to the park is by air or by the Morice River Forest Service Road from Houston to Morice Lake, then by canoe to Atna Bay, and three short portage trails to Atna Lake. Please see our Morice Lake Park page for detailed road directions. History: Atna Lake was first labelled on George Dawson’s 1879 Geological Survey map “British Columbia and the Northwest Territory from the Pacific Ocean to Fort Edmonton.” Atna River Park was established as a “Class A” Park in July 2008. The park is one of seven new parks and protected areas resulting from the Morice Land and Resource Management Plan (LRMP) and associated government to government discussions with the Office of the Wet’suwet’en. Culture: Atna River Park is located within the traditional territory of the Wet’suwet’en First Nation. Known as the “people of the lower drainage” the Wet’suwet’en have been living in this part of the continent since time immemorial. Within the Wet’suwet’en territory, Atna River Park lies in the C’iniggit Nenikëkh house territory in the house of Yextsowiten (Thin House) that belongs to the Gilseyhyu (Big Frog) clan. Mt. Loring (Leez Be’h) was utilized in times of need by all Wet’suwet’en clans and the Gitxsan to harvest Hoary Marmot and Caribou. C’iniggit Nenikëkh house territory played a critical role for the Wet’suwet’en and is known as “Common Basket”. This area is known to be very productive for resources and remains important to the Wet’suwet’en today. protects part of the C’iniggit Nenikëkh house territory, which is known as “Common Basket” and which played a critical role for the Wet’suwet’en. Atna River Park also provides important ecosystem services (the benefits that people receive from ecosystems) that include clean water, natural flood control, carbon storage, air purification, nutrient cycling, food, biodiversity, recreation, aesthetic experience and spiritual experience. The park plays an important role in regulating water quantity, water temperature, and release of spring melt waters, which is important for both fish habitat and downstream water users. Wildlife: Atna River Park provides important habitat for wildlife that live in and around the park. Atna River Park contains moderate to high value grizzly bear and summer and fall habitat and high quality mountain goat winter range. The park lies within the Caribou Habitat Management Area as identified in the Morice LRMP. The low pass (1200 m) at the southwest end of the park provides an important wildlife corridor to the Kemano, Dala and Kildala river valleys in the Coast Range, and the low pass between Atna Lake and the Gosnell River is an important travel corridor for wildlife at the northern end of the park. 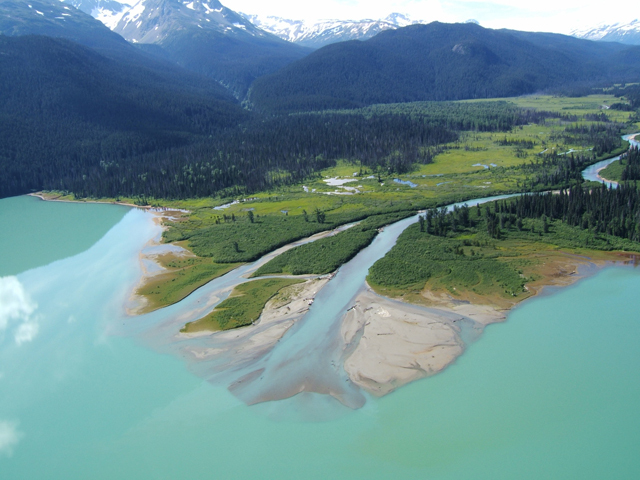 The Atna River contains sockeye and coho salmon, lake trout, Dolly Varden and whitefish and Atna Lake provides important beach spawning habitat for sockeye salmon. The management plan for Atna River Provincial Park was approved in Oct 2010. To access Atna River Park by canoe you must first drive to Morice Lake Provincial Park. Launch your canoe from the campsite at the NE end of Morice Lake. Most canoe parties plan to arrive at the campsite the night before in order to have an early morning departure. Morice Lake often has high winds and large waves making it dangerous for canoe parties. The safest time to paddle is early in the morning. From the campsite, the safest route is to follow the lakeshore to the north east and proceed around the head of the lake to reach the west shoreline. Proceed south west along the shoreline to reach Atna Bay. At the back end of Atna Bay, you will find the Atna River mouth. Proceed past the river mouth to the next small cove to find the portage trailhead. The first short portage (200m) is known as the “Corkscrew” as it winds around some old blow-down. After completing the portage, paddle upstream along the still pools of the lower Atna River to the waterfall and find the next portage to the right of the base of the falls. This portage is also short (200m), but the first portion around the falls is very steep. Paddle across the next pool of the Atna River to reach the final portage at the right side of the river outlet. This portage is the longest of the three at 320m. There are climbing opportunities in the park. The sport fish in the lakes are lake trout, Dolly Varden and whitefish. Anyone fishing or angling in British Columbia must have an appropriate licence. Portage trails link all the lakes and waterways of lakes, and provide safe routes around rapids and waterfalls. During the rainy season, portage trails may become rugged and muddy making passage challenging in places. Other than portages, there are no developed trails in the park. Pets/domestic animals must be under control at all times. You are responsible for their behaviour and must dispose of their excrement. Atna Lake is glacier fed and very cold. Most swimmers limit themselves to short dips for refreshment. There are plentiful wildlife viewing opportunities in Atna River Park. Campfires are permitted., but no campfire rings or developed campsites are provided. Paddlers must bring a portable stove for cooking. Wilderness, backcountry or walk-in camping is allowed, but there are no developed or maintained campsites in Atna River Park. Please keep your camping impacts to a minimum.